Perhaps one of the things I love the most about SWLing is the sheer variety of broadcasters out there. We can sample diverse offerings across a broad spectrum–from the BBC World Service to Radio Romania International, from pirate stations to numbers stations. There’s even The Disco Palace: a station that plays only disco music, and each show is mixed thematically. 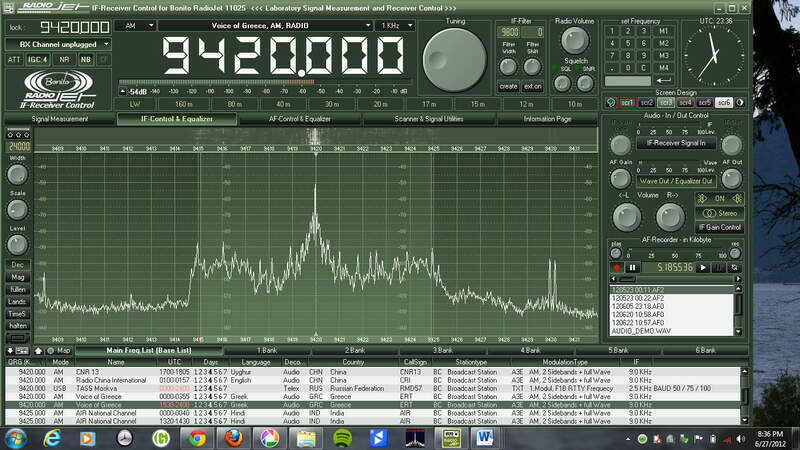 This station broadcasts online and over shortwave radio via DRM (Digital Radio Mondiale). Last week–specifically, on March 15, 2013–I caught about thirty minutes of The Disco Palace broadcast and was able to record it from my Bonito RadioJet IF Receiver. Reception on 17,875 MHz was excellent, although the DRM signal wasn’t quite strong enough for comfortable stereo decoding. This entry was posted in Broadcasters, Digital Modes, DRM, Music, Podcast, Recordings, Shortwave Radio and tagged Bonito, Bonito 1102S RadioJet, Digital Radio Mondiale, DRM, Radiojet, The Disco Palace on March 19, 2013 by Thomas. 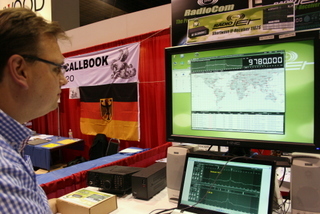 At the Dayton Hamvention this year, I met Dennis Walter, who is with Bonito, German manufacturer of the 1102S RadioJet. Dennis was kind enough to loan us a radio for review on SWLing.com. I have been evaluating the Bonito 1102S RadioJet over the course of eight weeks and have formed some impressions about its performance. And while I haven’t made any A/B comparisons yet with either the Microtelecom Perseus or the WinRadio Excalibur–both on my review table at the moment–I have taken the time to get to know this lean, high-performance IF receiver. When I first held the RadioJet, I was amazed at how small and sturdy the unit is. It’s built quite well; I expect you would have difficulty putting a dent in its aluminium body. It has a very small footprint on the desktop and fits very easily in my suitcase. Specifically, the RadioJet box is about the size of the highly portable Tecsun PL-380—in fact, the PL-380 is slightly wider than the RadioJet. And though I knew about this feature in advance, what really stands out is its lack of dependence upon a power cable or a DC-in jack on the back of the unit. Indeed, the only two connections are a USB port and a female BNC connector for the antenna. The RadioJet derives its power directly from the USB cable. This is a major plus, providing additional freedom, as there’s no need for an external power supply or “wall-wart” type DC adapter. With the radio and USB cord, you’re ready for radio on-the-go—as I was on my recent DXpedition family vacation, when I reviewed the RadioJet. Installing the RadioJet is very simple. You simply plug the receiver into your computer via the supplied USB cable, then install the RadioJet software via the supplied installation disc. As far as I know, the RadioJet software only works with Windows PCs. I tested the RadioJet with my Toshiba Satellite 64 bit Intel core i3 laptop computer. I had no difficulty getting the RadioJet running. Indeed, it worked after the first software install. In my experience, it was true plug-and-play. Is the RadioJet an SDR? To be clear, the RadioJet is technically not an SDR, it is an IF receiver, more like the Ten-Tec RX-320D. I’ve certainly been guilty of calling it an SDR in the past as it’s easily to lump it in the same category. Within this review, I do compare RadioJet features with SDRs currently on the market since it is software (PC) controlled, has many of the same features as an SDR and directly competes with them. 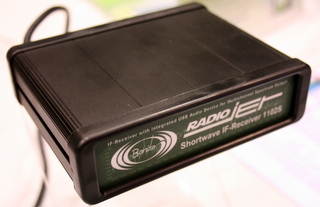 Unquestionably, the Bonito 1102S RadioJet’s software offers the most flexibility of any Software Defined Radio (SDR) or IF receiver I’ve ever reviewed. Having used several SDRs and IF receivers–including the Microtelecom Perseus, Ten-Tec RX-320D, RFspace IQ and WinRadio Excalibur—I can state that the basic functions of the RadioJet are comparatively easy to locate. The graphic user interface (GUI), however, could appear somewhat complicated, particularly if you are new to software based receivers. While I like options and the ability to customize a user interface to best match my preferences, having a GUI that is both highly-adaptive and full-featured can be a double-edged sword until you become accustomed to it. 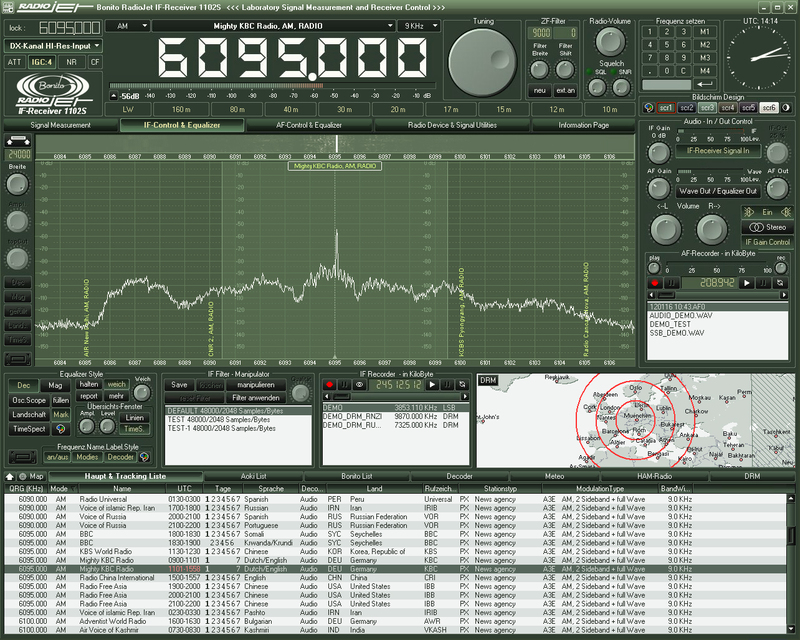 On one hand, you can customize the RadioJet GUI more completely than any other SDR I’ve ever used: you can change the window size, layout, spectrum display, and color palette; you can also load pre-designed screens to help with signal measurement, IF control, and AF control. Indeed, the RadioJet’s designers have also included a unique “Scanner and Signal Utilities” screen for working with utility reception. On the other hand, there is a learning curve in both customizing the GUI and familiarizing yourself with the radio’s controls. This is why I wish the RadioJet had a proper owner’s manual. Early in my experience with the unit, while making setting modifications during a broadcast, I found I could lose my place within the control settings or accidently alter a setting that would result in degraded reception (such as the WAV volume, AGC, DSP or attenuator). I thought that the RadioJet was malfunctioning, only to discover that I had a setting adjusted incorrectly. Note that Bonito’s online support, however, has been very responsive in helping me when this happens. 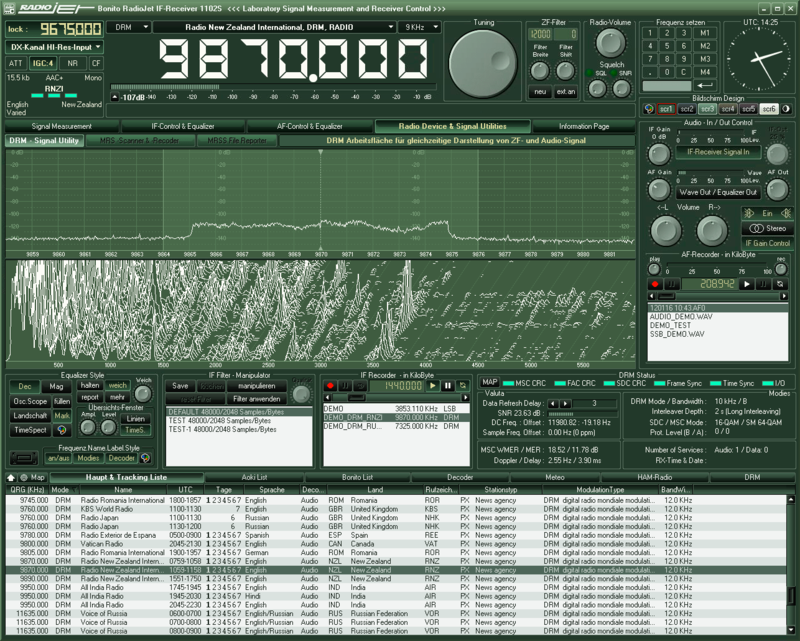 Fortunately, Bonito is fully aware that many listeners could be overwhelmed by the various options the RadioJet offers, and have designed the GUI so that if you minimize the window (as you would any Microsoft Windows “window”), only the basic receiver options will display. The only major drawback I’ve observed with the RadioJet, as fellow reviewer Fenu mentions in his comprehensive review, is that its software still has a few trouble spots to be ironed out. This is not surprising, considering that is very new to the market. To be clear, software is a very important part of an SDR or IF receiver’s usability: after all, its interface is software defined. An SDR or IF receiver without the software is merely a small paperweight–but with it, becomes highly functional radio with a performance that can be enhanced with upgrades over time. The success of the RadioJet over time will be directly tied to the responsiveness of Bonito to customer feedback. Like Fenu, my experience with Bonito is quite encouraging in this regard—Bonito has even provided remote desktop help sessions for individuals, and I can personally vouch that I’ve benefitted from this support. Bonito also closely attends to discussions on the RadioJet Yahoo Group, indicating that the company is listening to their customers. Bonito has been updating the software regularly—in fact, they’ve just added a noise blanker to the software which, I hear, effectively deals with electrical pulse noises like those produced by electric fences. 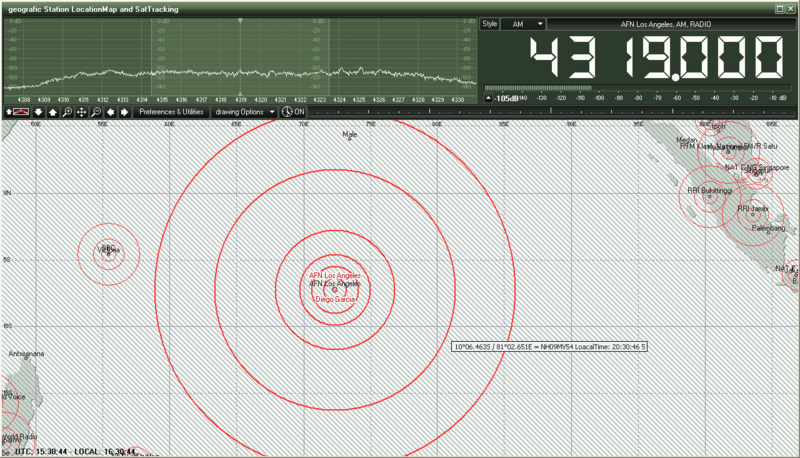 With the scroll wheel of the mouse, you can easily adjust most settings and filter controls of the RadioJet. It acts, in a sense and in most cases, as a proxy for a tangible knob you would have on a traditional radio. I imagine there are other (perhaps even better) peripherals that would work, too. I do find the controls a bit frustrating to manipulate if you do not have at least a mouse with a scrolling wheel. I did not bring a mouse on my recent DXpedition and later regretted the decision. The track pad on my Toshiba laptop does not offer the accuracy and scrolling features needed to fluidly operate the RadioJet GUI. Unlike a lot of SDRs on the market, the RadioJet does not have the ability to record large chunks of HF spectrum. 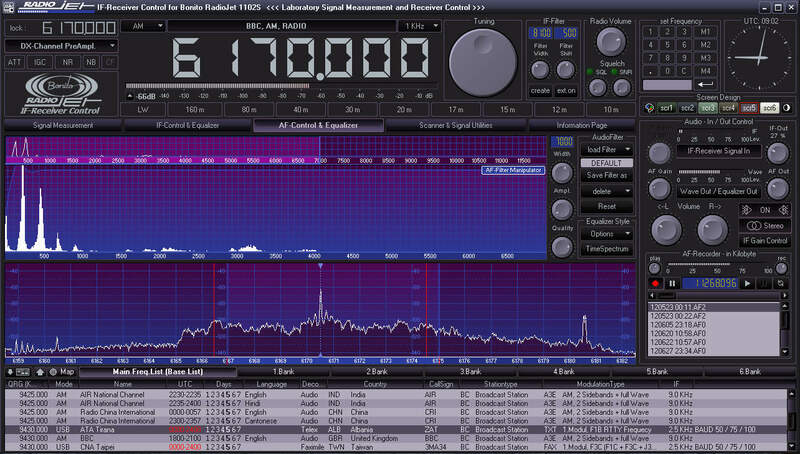 For example, the WinRadio Excalibur and Microtelecom Perseus can record 2,000 kHz of spectrum; the RadioJet, however, is limited to 24 kHz. I asked Dennis at Bonito about this and he said that when designing the RadioJet the designers focused on the performance of the received signal and the radio’s overall efficiency rather than upon having a wide IQ output. Bonito is catering to the discriminating DXer who is seeking the highest quality signal upon receiving, even among weak signals, but who is less interested in spectrum recording. Personally, I like to record and archive spectrum, but I do appreciate this focus upon delivering the best possible received signal, even with a very modest computer. Indeed, unlike most other SDRs on the market, the Bonito 1102S RadioJet reportedly works well on Netbooks with Atom processors. I can say that my Intel Core i3 laptop runs the RadioJet beautifully. I do plan to try the RadioJet on my netbook soon, as well. One unique and highly-promoted feature of the Bonito 1102S RadioJet are the RX and DX “Channels” or operating modes. On the Bonito site, they show an example of a very weak signal showing up on the spectrum display, almost totally hidden in the band noise. When the user switches to the “DX Channel,” however, the noise floor drops and the received signal pops out, and becomes armchair listening. 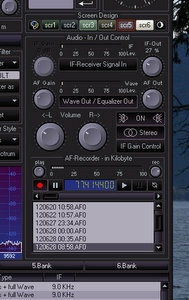 I have found that the DX Channel is indeed very effective at pulling a weak signal out of the noise. The RX Channel, on the other hand, does an even better job of receiving stronger broadcasts signals. The channels appropriately balance AF and RF gains along with the raw IQ to deliver the receiver’s very best under prevailing conditions. I find that I switch between the two channels rather frequently, and tend to do so manually. There is a setting in which the RadioJet will automatically determine what settings should be used to best hear the target broadcast—it switches very quickly between the RX and DX Channels and even makes small adjustments to the AGC and other settings. Though quite effective, I still prefer to manually adjust these features to enjoy greater control of them. This is perhaps one of the most fluid and flawless features of this radio. Though I have not had an opportunity to record DRM yet, I have decoded several broadcasts with great success (REE, Vatican Radio and RNZI). In fact, if you are looking for a an excellent DRM receiver, the RadioJet may be your best bet. Unlike many SDRs on the market, the RadioJet decodes DRM natively: in other words, you simply tune to a DRM signal and change the mode from AM to DRM. That’s all. Your software already has a built-in, paid-in-full decoder (no need for a costly plugin or DREAM license). It’s the best implementation I’ve ever tried. When I begin a radio review, I keep a checklist of pros and cons as I discover them. In this way, I can remember my initial discoveries. I would also recommend the RadioJet to those who don’t want a receiver to task their computer’s processor excessively. If you are looking for a mature, simple software defined radio—or if you need wide spectrum recording–you may want to check out a true software defined radio (SDR) from WinRadio, RF Space or Microtelecom. In my opinion, the only drawback to the RadioJet, as of time of this review publication, is that the control software is not yet refined and still has a few bugs. None of these limitations have affected my ability to use the RadioJet, but they have proved annoying at times. My impression of Bonito and their staff is that they are trying in earnest to respond to customer feedback and focus on delivering an effective receiver for the DXer and for those wishing for excellent performance on a budget. If this attentiveness continues, the RadioJet should only improve with time. The US price tag for the Bonito 1102S RadioJet is $689 through Universal Radio. This is fully $300 less than the Microtelecom Perseus. If you want serious performance, from a lightweight, rugged, flexible software controlled receiver, you should be pleased with the RadioJet. UPDATE: Want to hear a broadcast recorded on the RadioJet? Check out my previous post on the final broadcasts of RNW. The RadioJet did an amazing job pulling this station out of the static. 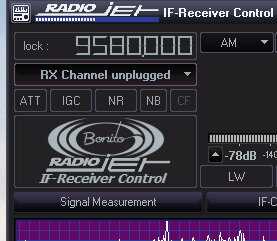 Follow our tag “RadioJet” for updates to this review and future A/B comparisons with other receivers. SWLing Post regulars know that I don’t post highly technical or “laboratory” reviews. Take this review as my experience as an experienced shortwave radio listener, where I focus on usability, receiver quality, and audio fidelity, and provide general operating notes. I also focus on helping consumers make purchase decisions, as I outline the pros and cons of each receiver. For a more technical review, I would refer you to previously-mentioned Fenu’s review and–potentially upcoming–Rob Sherwood’s receiver performance data. This entry was posted in Manufacturers, New Products, News, Reviews, Shortwave Radio, Software Defined Radio and tagged Bonito, Bonito 1102S RadioJet, Bonito 1102S RadioJet Review, Bonito RadioJet, Bonito RadioJet IF-Receiver 1102S, Bonito RadioJet IF-Receiver 1102S SDR, IF-Receiver 1102S, Radiojet, Shortwave Radios, Software Defined Radio, Update Bonito RadioJet IF-Receiver 1102S, Updates Bonito RadioJet IF-Receiver 1102S on July 17, 2012 by Thomas. Universal Radio has published the price of the Bonito 1102S RadioJet at $699.95 US and they are taking orders. Universal’s price is $300 less than that of the Microtelecom Perseus ($999.95 US) and the $200 less than the WinRadio Excalibur ($899.95 US). After reading Fernando’s review of the RadioJet–where he compared it to the Perseus–this may be one of the best SDR performers for the price. We will be reviewing the Bonito 1102S RadioJet in the near future as well. This entry was posted in Manufacturers, New Products, Retailers, Shortwave Radio, Software Defined Radio and tagged Bonito, Bonito 1102S RadioJet, Bonito 1102S RadioJet Review, Bonito RadioJet, Bonito RadioJet IF-Receiver 1102S, Bonito RadioJet IF-Receiver 1102S SDR, IF-Receiver 1102S, Radiojet, RadioJet Pricing, Shortwave Radios, Software Defined Radio, Universal Radio, Update Bonito RadioJet IF-Receiver 1102S, Updates Bonito RadioJet IF-Receiver 1102S on May 4, 2012 by Thomas. I just received the word from Dennis at Bonito. The Bonito 1102S RadioJet SDR (software defined receiver) now has FCC approval. This means that the RadioJet will be available for purchase in the US. We will be reviewing the RadioJet in the near future. I, for one, can’t wait–especially after reading Fenu’s review. If it has Perseus performance at a much lower price point, this could be a very competitive receiver. This entry was posted in Manufacturers, New Products, News and tagged Bonito, Bonito 1102S RadioJet, Bonito 1102S RadioJet Review, Bonito RadioJet, Bonito RadioJet IF-Receiver 1102S, Bonito RadioJet IF-Receiver 1102S SDR, IF-Receiver 1102S, Radiojet, RadioJet Pricing, Shortwave Radios, Software Defined Radio, Update Bonito RadioJet IF-Receiver 1102S, Updates Bonito RadioJet IF-Receiver 1102S on April 25, 2012 by Thomas. Universal Radio has published the “List Price” of the Bonito 1102S RadioJet at $784.00 US. This could make the RadioJet a very strong competitor to other SDRs on the market in North America. The list price (not necessarily the final price Universal will announce–which could be lower) is $216 less than that of the Microtelecom Perseus ($999.95 US) and the $116 less than the WinRadio Excalibur ($899.95 US). This entry was posted in DRM, New Products, Shortwave Radio, Software Defined Radio, Updates and tagged Bonito, Bonito 1102S RadioJet, Bonito 1102S RadioJet Review, Bonito RadioJet, Bonito RadioJet IF-Receiver 1102S, Bonito RadioJet IF-Receiver 1102S SDR, IF-Receiver 1102S, Radiojet, RadioJet Pricing, Shortwave Radios, Software Defined Radio, Update Bonito RadioJet IF-Receiver 1102S, Updates Bonito RadioJet IF-Receiver 1102S on April 15, 2012 by Thomas.